Everything in the Whiteface Region is big, right? There are big mountain rivers, big mountain views, and the biggest vertical drop in the East. I wasn't surprised to learn that it's also home to one of the biggest beer selections around! About a month ago I wrote a blog on some of the wonderful and diverse camping opportunities in the region. You can go rustic or luxurious — it's all here. While working on the blog I stopped by North Pole Resorts to learn about what the campground is like. I was greeted with a "Hello!" when I walked through the door, and by a reach-in cooler that was packed full with beer. Closer inspection revealed the bottles and cans were from microbreweries, many of them within a day's drive of the Adirondacks. 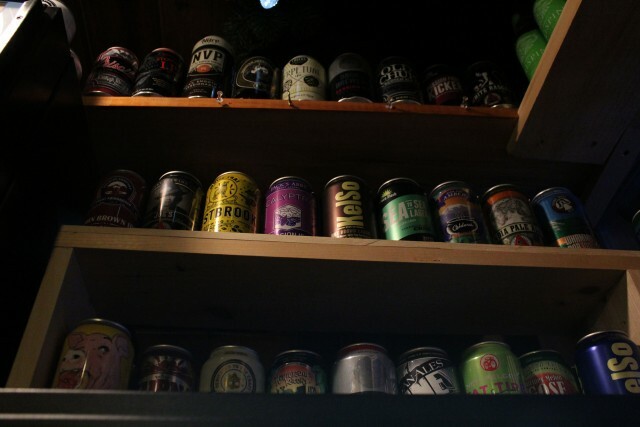 The North Pole General Store has 240 different beers. They're sold as singles, so you can mix and match whatever you'd like. There's also a beer of the week, which is the irresistable price of $1.69 per bottle. I brought home a six pack of last week's special, Dark Horse Crooked Tree India Pale Ale, and it was delicious. If you prefer to lug a growler around like a true mountain man, the general store now has two varities — a two-pint and four-pint growler — that can be filled with one of the three rotating beers on tap. They're great for loosening up to a campfire singalong, and they also double as an instrument if you blow across the top of the opening. Just take another swig to change the pitch! Since it's in the Wilmington Region, North Pole Resorts is located close to outdoor recreational opportunities. You can rent a boat and paddle the Ausable River right from the campground, or cross the street to hike or mountain bike the area's extensive trail system. And if you're into mountain biking, check out the North Pole's selection of canned beer — since cans won't shatter if dropped, they're what you should pack for your next trailside happy hour. If you prefer high-octane cocktails over the suds, North Pole Resorts also has a liquor store. Stock up on mixers at their General Store and you'll be good to go. The Whiteface Region is a destination for adventure, and if you want to capitalize on the action you can visit the Whiteface Mountain Ski Center. The winter offerings are obvious — lots of downhill action for boarders and skiers of all levels — but summer is just as exciting. At the base of the mountain is the Adventure Zone, a play area for kids and adults who want to do things like jump off a platform into an enormous, inflatable mat or bounce ridiculously high on a trampoline. If you simply want a ncie view, take a gondola ride to the top of Little Whiteface and enjoy the surroundings. Don't want to take the easy way down? Rent some downhill gear and shoot down one of the mountain's many downhill mountain biking trails. What does any of this have to do with beer? After you've had your fill of adventure, stop by the J. Lohr Cafe and Wine Bar, located in the base lodge, and have your fill of New Yok state sourced food. And beer. The selection isn't as extensive as the North Pole's, but you can still find a bottle of a good microbrew, including the Lake Placid Pub & Brewery. If you've come to the Whiteface Region to tip a few back, be safe! Stay at a campground, book a room, or rent a cabin.